"Maintaining a constant bass weight in your mix is vital." There are a huge range of sounds you can coax out of a bass guitar, from the dull, super-fat sounds of dub reggae, to the bright, distorted and relatively thin sounds of Lemmy's Rickenbacker. Bass guitars are often just DI'ed, but the contribution of an amp should never be underestimated in terms of saturation, drive and the simple act of shifting air and recording it. In the absence of an amp, there are plenty of amp sim and saturation plugins that can approximate the effect. The sound of the bass guitar (or synth) follows a similar pattern to the kick drum: with a front attack, or 'nose' - mainly composed of mid frequencies - followed by a deeper sustain that carries the fundamental frequency (the root note). The number and volume of harmonic frequencies will determine the tone. In most instances, the tail of the bass note is longer than the kick, as we need to be able to perceive its tone and melody in order for it to qualify as 'a note'. Varying the length (and thus gap between notes) is a useful dynamic device: we perceive shorter notes as quieter, so by increasing the length of the notes throughout a piece, the track may start to sound 'bigger'. Dynamics-wise, you'll usually want to keep bass at a consistent level throughout the course of a track to maintain a consistent low-end weight in the mix. Compression is the obvious processing choice for evening out low-end dynamics, particularly with a bass guitar part performed by a human player, which can vary wildly in dynamics from passage to passage. But be aware of the dangers of compression, as well. Low frequencies will trigger the compressor first, which can often ruin the front end of the bass; consider using either a compressor's sidechain filter to prevent bass frequencies from tripping the compressor's sidechain circuit, or a multiband compressor to target specific frequencies and maintain an even balance between the sound's attack and its subsequent weight. Saturators are useful here too, because - just as with kicks - you can use them to enhance the harmonics of the attack and the decay, binding the overall sound together with that sonic 'glue'. 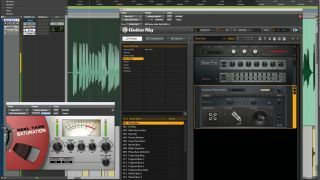 In this walkthrough, we'll show you the specifics of using compression, EQ and saturation to make a bass guitar sound awesome. Download the accompanying audio stems to this tutorial. Step 1: Maintaining a constant bass weight in your mix is vital, but a human player isn't always consistent, so compression is used to even out dynamic inconsistencies. Try an Attack of around 3ms, so as not to choke the transients, and a medium-to-fast Release (somewhere in the region of 200-400ms), set slow enough to avoid the unpleasant distortion that very fast release times can introduce. A multiband compressor working in a similar way can target specific frequencies, as shown. Step 2: If the kick is providing the bulk of your mix's low-end weight, try rolling off the sub bass frequencies from the bass signal with a high-pass filter. We're low-cutting our bass guitar with a 24dB/oct filter at 68Hz. If this has thinned out the signal too much, you can boost around 80-120Hz to compensate. A narrow Q cut between 200Hz and 250Hz can bring clarity without taking away weight; and finally, a boost between 600Hz and 800Hz adds mid-range punch. Step 3: Several stages of distortion can add up to a thicker, warmer bass guitar sound. This bass guitar part was recorded through a Sansamp Bass DI pedal, so the signal is already saturated a little on the way in. Next, a tape saturation plugin enhances harmonics and helps glue the bass guitar into the mix. Finally, try an amp simulator plugin such as Guitar Rig from Native Instruments if you need more extreme bass guitar distortion. For much more on mixing and processing bass, pick up the July edition of Computer Music (CM231), with its Kick & Bass Power cover feature.